Martin is nearly done with his Sophomore year at college. He's learned a lot in the last two years and he's done a lot of beautiful work. I've been meaning to write a post about his art for ages, and finally, I'm getting around to it. 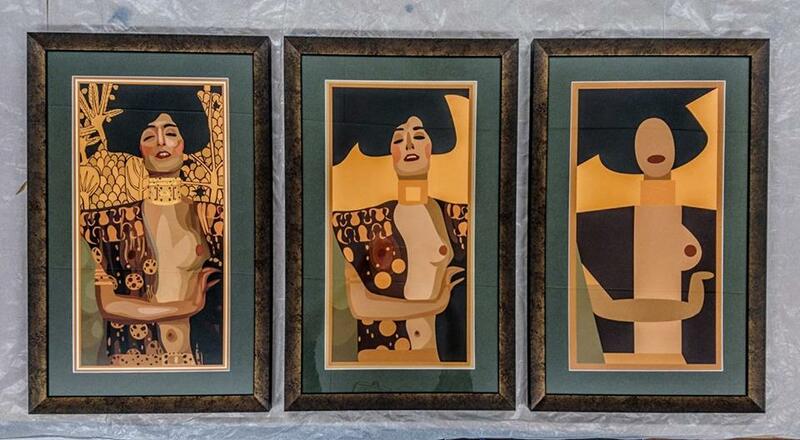 The catalyst was the fact that last week I dropped off three of his prints that I absolutely LOVE, at a new frame workshop that I found in the next village over and I picked the framed pieces up today, and they are BEAUTIFUL. The triptych was the result of an assignment Martin had during Freshman year in a graphic arts class, where he was supposed to choose a famous painting and do a graphic rendering of it in three parts: simple, simpler and simplest (or complicated, less complicated and least complicated, I guess you could also say). Martin choose Judith and the Head of Holofernes by Gustav Klimt, though he obviously didn't know the title of the work when he chose it, because he told me later that he got really hung up when he was halfway through the project until he suddenly realized that what she was holding was a SEVERED HEAD and that gave him the jolt of energy he needed to get the job done! Hahaha! We hung them tonight, in the living room, and they look fantastic. I am so pleased, both by the beautiful artwork that MY CHILD produced and the framing job that was done for them (for much less than the price I was originally quoted in Lund). The series of images he did before Christmas are particularly fun. He only has about half of them up on Instagram, but he did around 20 of them all told. They are all students at the school, and the backgrounds are the tops they are wearing. He did a fantastic job on the series, and I would be very hard pressed to choose a favorite. He's showing a real affinity for portrait work and fashion photography, and I love all of them. Even though it's pretty certain that he won't be able to continue at this (extremely expensive) school, I think that what he will take away with him will stand him in good stead. He went in with a good eye and an artistic nature, and I think he'll be coming out with techniques, knowledge and hopefully, the drive to move forward with his photography dream.